We check in at Krystal Lodge (some signs spell it as Crystal Lodge), then went off to settle in our hut. We have asked Mai, Krystal Lodge’s manager about boats we can use for island hopping. She refered Eran, a seasoned guide, who proceeded to tell us about the must see places for island hopping. We told Eran that before anything else, we wanted to have lunch. 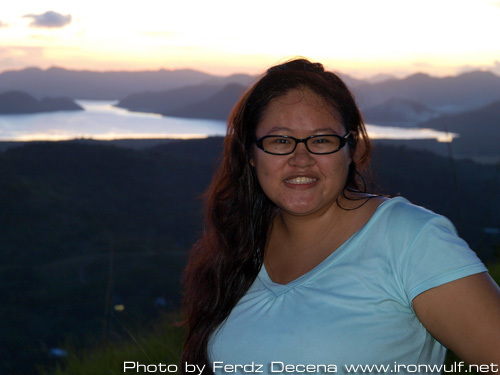 Eran took us to the town center, and as we walk, none of us could really believe that we’re already in Coron. After settling in a carinderia, Eran left us to tend to his other contacts. 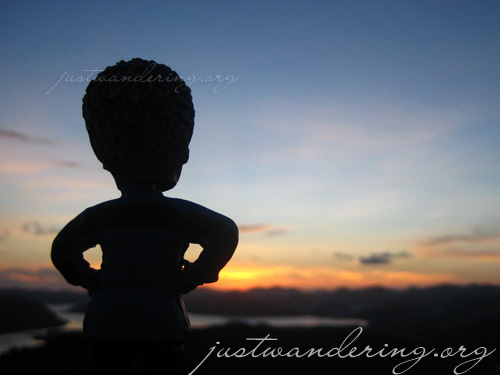 He came back just as we were finishing, and we were off to an informal tour of Coron town. The town is quite small. You can easily walk from one place to another, though if you’re tired, you can hail a tricycle. Tricycles are the main public tranport option in the small town of Coron. There are jeepneys and busses, but they are only for traveling long distances. A ride in the tricycle costs Php 7 each around town, and I was surprised that the tricycle driver actually gave me change and didn’t overcharge. For longer distances, like to Mabentangin pool and Maquinit Hot Spring, you’d have to agree on a fee beforehand. These two places are more than 2 or 3 kilometers from town (Maquinit is about 4 kilometers away), and if you’re going there, you have to ask your driver to wait or come back for you. 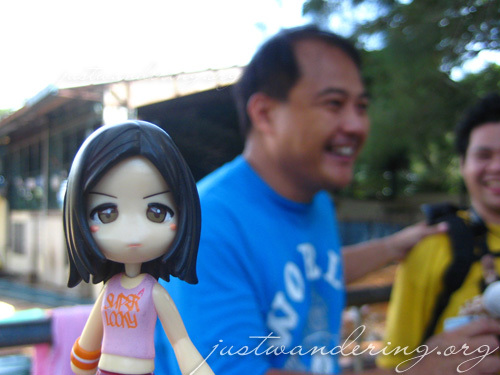 We paid Php 125 for a two way trip to Mabentaning, and Php 200 one way from Maquinit into town. 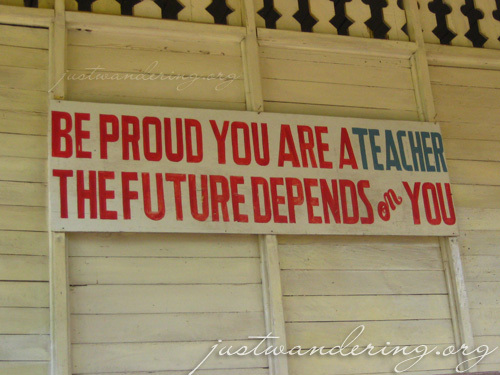 Be proud you are a teacher. The future depends on you. Walking through Coron town, we passed through the town hall. Right across it was a basketball court there Coron Mayor Marjo Reyes was playing. We were astounded that we can just walk into town and meet and have a chat with the mayor. Like any homeowners, Mayor Reyes welcomed us into Coron, his home. And like any homeowners, he apologized at how dirty the town is. We were shocked at this — less than ten minutes ago, we were all marveling at how clean and orderly Coron was. According to the mayor, Coron is already dirty; it used to be so clean and they’re working towards bringing it back to its pristine state. Dang. I wonder if Manila mayors can promise and deliver the same? We walked into the public elementary school, where we saw a building that has been standing since the time of the Japanese occupation. There’s also some rumors going around that there’s gold underneath this building. Hmmmmm. Back into the town center we go, heading this time to the market to buy dinner. 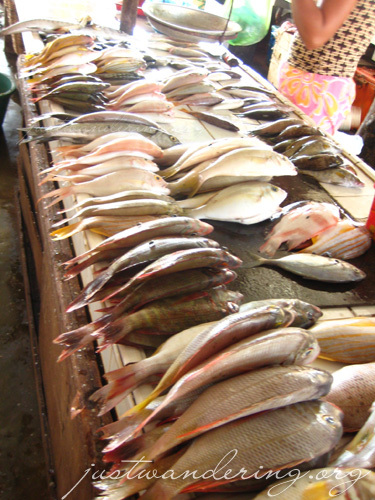 Ferdz and Marc picked out a couple of fishes, and one huge lapu-lapu, and 3/4 kilo of shrimp. We also bought two kilos of rice, some tomatoes, onions and calamansi to go with the grilled fish. This trip to the market set us back around Php 550. Krystal lodge has cooking facilities, which you can use for a small fee. Eran was an all around guide; he even cooked our shrimp and rice for us. We took our seafood haul back to the lodge, and set off for Mt. Tapyas. Where in the Philippines is Gert Boyle? I didn’t read much about Coron prior to coming here, but I received a text from a friend who’s been there before that he climed 700+ steps to reach its summit. We walked from the lodge to the jump off point, a feat in itself quite taxing. There are several benches lining the steps should you get weary, and about four that’s covered. Gail and I stopped at the first covered rest stop and chatted about… things. We never thought we’d ever go up to the summit, but when a caucasian coupled passed us on their way up AND down, we got up and started climbing. Just a short climb from where we stopped was a picnic area. The area was built in a plateu, so it was mostly walking on flat ground and a couple of gradual steps. We passed Marc going down on the way up. He was going back to the lodge, after going up and taking photos from the summit. There wasn’t any shops selling cold drinks at the top, so it’s advisable to bring some bottled water when going up Mt. Tapyas. After several rest stops, Gail and I finally reached the summit. Yay, my second mountain for the year! Who’d have thought? We made it just in time — the sun has set, the last rays of light setting off beautiful colors in the horizon. 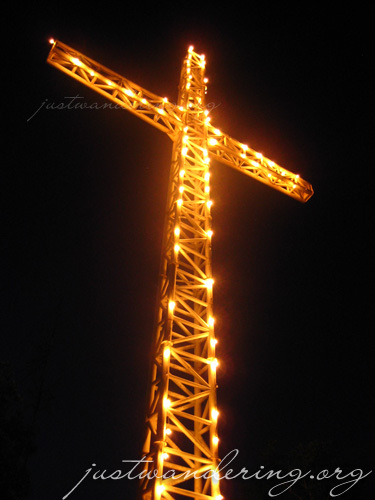 When it got dark, the cross on top of Mt. Tapyas lit up. Even with this shining beacon, majority of Coron is still uninhabited, so the stars can be clearly seen in the sky. Leaving nothing behind but memories (heehee), we started our descent back into town. The path was lit by several lamp post, but there are areas when it gets really dark. It was lucky that I brought my flash light along. We made it all the way down without stopping, but by the time we reached the bottom, our legs has turned into jelly. Stopping for some cold drinks at the first sari-sari store we came upon, we waited for a tricycle to come along. We gingerly got in and within a minute, we were at the Krystal Lodge, where a sumptous dinner of fresh shrimp awaited. The shrimp was simply boiled, but it was the best shrimp we’ve ever tasted. Dinner was even better with great company and conversation, and after hours of talking about mangroves, coffee and rabid fanboys, we retired to our huts to get some much needed sleep. We’re island hopping tomorrow. leave nothing but memories…. ahahhaah how cheesy!! I saw that motivational poster too. Only in the Philippines where you step into a school, and the motivational posters are for the teachers! I love that saying “Be proud you are a Teacher, the future depends on you”…..good thing that I took up education and finally realized that my spiritual gift is in teaching…. Ronnie: Haha, maybe they have something inside the classroom for students? Hey, if I were a teacher, I’d be inspired by this quote! Eric: Good on you, Eric! Shoot! I didn’t realize there was a place called “The Cross atop Mt. Tapyas”. I was just by the sea most of the time. great blog… it’s totally inspiring quote for the teachers and my father was a teacher where that board posted.